Joker Wild Double Up is an online poker game that plays very well alongside an already existent game. Poker is one of, if not the, biggest table games in the world. This is very much a homage to various classic casino games, sporting a fast gameplay type of environment that has the chance at equalling a rather generous cash pay-out. What this online table game has over its peers is style and consistence. Everything works very well in creating a very realistic telling of what it might be like sitting at a table in Las Vegas. What Joker Wild Double Up has that other online poker games doesnt is hinted at in its name. The double up gamble feature allows playersto guess the colour of the next card which can then double the score indefinitely. In 1996 Net Entertainment was formed in Sweden as an offline casino operator, today NetEnt is one of the leading names in online gaming that now stretches worldwide. The ever-growing list of games that NetEnt have created have, if anything, inspired many other games within the market, this is something that is completely unheard of in modern day gaming, where re-inventing the wheel can be difficult when there is already a set path of creating a successful slot. Since its inception NetEnt have produced over a hundred titles, each with their own significant themes and experiences. 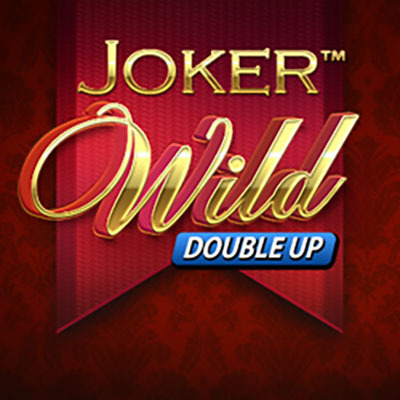 Joker Wild Double Up is a single player poker game where you face digital opponents, with a variety of different hand games to choose from, ranging from 1-25 games. There are tutorial versions of this game that can give you an idea on what to expect from this game. We would recommend playing this slot on a low bet amount just to begin with so players can experience what it is like playing it with a much higher deposit. Pushing the limits of readily existent games is part of NetEnt’s job description, which is why Joker Wild Double Up is quite different from most other online poker games. We can’t recommend this game enough. If you’re sick of playing poker games without an edge than maybe you might find what you’re yearning for in Jokers Wild Double Up? We would like to think yes, as would NetEnt who have only done this for your benefit (and the money too obviously).